With a meagre $28 million opening weekend, it looks like this year's Edge of Tomorrow may fail to even reach $100 million at the US box office - a massive disappointment considering its enormous budget of $178 million. Watch a trailer for the film and the reasons for this seem evident - we are shown a generic, loud action blockbuster, bombarding us with explosions, shouting and lightning fast cuts. A type of film we're surely tired of seeing, right? Yes. 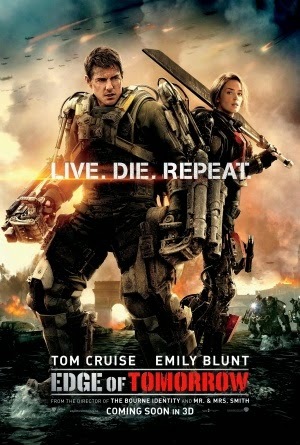 But when you sit down and watch Edge of Tomorrow, you'll find it is anything but that. The film sees Major William Cage (Tom Cruise) stripped of his rank and forced into battle with extraterrestrial invaders dubbed Mimics, who are on the verge of bringing humanity to its knees. Though killed during the disastrous beach assault, Cage inexplicably wakes up the previous morning with the memory of the events intact. His power continues to thrive as every death results in the day being reset, allowing him to alter events and anticipate the future. His ability is soon shared with Sergeant Rita Vrataski (Emily Blunt), who teams up with Cage to bring the invading Mimic race to an end once and for all. Edge of Tomorrow may be poorly advertised, but the content within it is truly admirable. The plot is surprisingly clever, with a simple premise to avoid over complication but still enough twists and turns to keep audiences hooked. The script also embraces its chances at comedy without being too silly; this dark, thematic 'Nolan' approach a lot of summer movies are adopting is not embraced, so the film is just as fun as it is thrilling. Tom Cruise truly shines as William Cage, whose development is much more interesting alongside the time loop plot; he relives all these events but develops as a character, resulting in some interesting restructuring of certain scenes as we revisit them. Emily Blunt shares a nice chemistry with him, and represents yet again that women can be just as badass as men in action films. The time loop is never gimmicky, and neither are the alien invaders. There's plot holes, which are pretty much unavoidable in time travel, but never do they distract from the meat of the story and usually they're quite insignificant. Perhaps the most widely discussed problem about the script is the ending; it slightly retcons the entire narrative, but remains a satisfying conclusion that isn't as cliché as people are making it out to be. You may be marketed a generic budget blockbuster with dazzling special effects, but Edge of Tomorrow is far from a superficial bore - great characters and a clever script make it an essential watch for young and old audiences alike, and I hope more people will start to support it.